Short Description: The mini-course MAKE-Health follows a research-based teaching (RBT) approach and discusses experimental methods for combining human intelligence with machine learning to extract and discover knowledge from health data. For practical applications we focus on Python – which is to date the worldwide most used language for machine learning and knowledge extraction. Motto: Science is to test crazy ideas – Engineering is to put these ideas into Business. Machine learning (ML) is the most growing field in computer science (Jordan & Mitchell, 2015. Machine learning: Trends, perspectives, and prospects. Science, 349, (6245), 255-260), and it is well accepted that health informatics is amongst the greatest challenges (LeCun, Bengio, & Hinton, 2015. Deep learning. Nature, 521, (7553), 436-444). Future Medicine will be a data science and Privacy aware machine (un-)learning is no longer a nice to have, but a must. Internationally outstanding universities count on the combination of machine learning and health informatics and expand these fields, for example: Carnegie-Mellon University, Harvard, Stanford – just to name a few! “By 2020, the market for machine learning applications will reach $40 billion, IDC, a market research firm, estimates. The goal of ML is to develop algorithms which can learn and improve over time and can be used for predictions. In automatic Machine learning (aML), great advances have been made, e.g., in speech recognition, recommender systems, or autonomous vehicles. Automatic approaches, e.g. deep learning, greatly benefit from big data with many training sets. In the health domain, sometimes we are confronted with a small number of data sets or rare events, where aML-approaches suffer of insufficient training samples. Here interactive Machine Learning (iML) may be of help, having its roots in Reinforcement Learning (RL), Preference Learning (PL) and Active Learning (AL). The term iML can be defined as algorithms that can interact with agents and can optimize their learning behaviour through these interactions, where the agents can also be human. This human-in-the-loop can be beneficial in solving computationally hard problems, e.g., subspace clustering, protein folding, or k-anonymization, where human expertise can help to reduce an exponential search space through heuristic selection of samples. Therefore, what would otherwise be an NP-hard problem reduces greatly in complexity through the input and the assistance of a human agent involved in the learning phase. However, although humans are excellent at pattern recognition in dimensions of ≤3; most biomedical data sets are in dimensions much higher than 3, making manual data analysis very hard. Successful application of machine learning in health informatics requires to consider the whole pipeline from data preprocessing to data visualization. 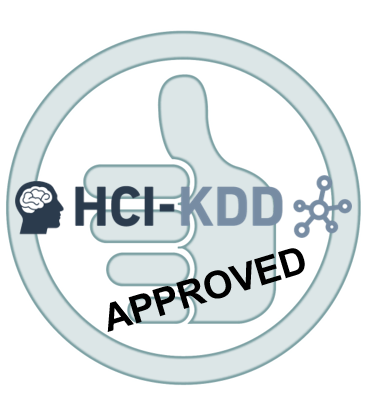 Consequently, this course fosters the HCI-KDD approach, which encompasses a synergistic combination of methods from two areas to unravel such challenges: Human-Computer Interaction (HCI) and Knowledge Discovery/Data Mining (KDD), with the goal of supporting human intelligence with machine learning. 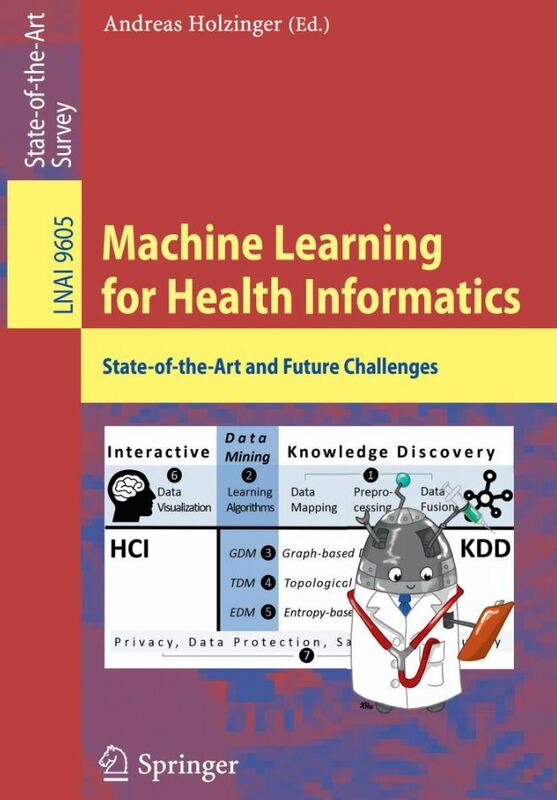 For the successful application of ML in health informatics a comprehensive understanding of the whole HCI-KDD-pipeline, ranging from the physical data ecosystem to the understanding of the end-user in the problem domain is necessary. In the medical world the inclusion of privacy, data protection, safety and security is mandatory. This three-module (lucky Chinese number three) course provides an introuction into some selected topics of machine learning and knowledge extraction (MAKE) for health informatics. 2) Python Tutorial Paper: M. D. Bloice and A. Holzinger, “A Tutorial on Machine Learning and Data Science Tools with Python“, in Machine Learning for Health Informatics, Lecture Notes in Artificial Intelligence LNAI 9605, Springer, 2016, pp. 437-483. In the first module we get only a rough overview on the differences between automatic machine learnig and interactive machine learning and we discuss a few future challenges as a teaser. 1) are aware of the problematic of health data and understand the importance of data integration in the life sciences. 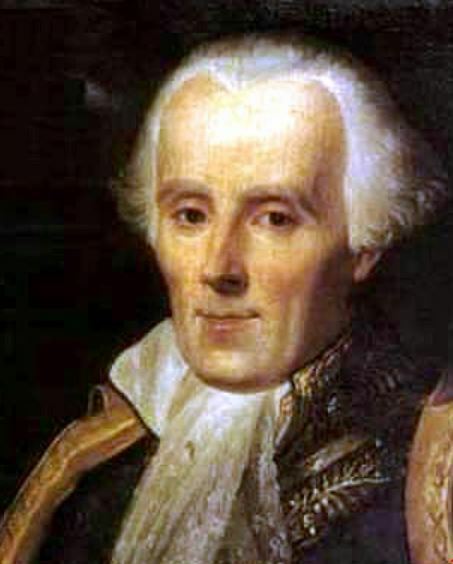 2) understand the concept of probabilistic information with a focus on the problem of estimating the parameters of a Gaussian distribution (maximum likelihood problem). 3) recognize the usefulness of the relative entropy, called Kullback–Leibler divergence which is very important, particularly for sparse variational methods between stochastic processes. Galas, D. J., Dewey, T. G., Kunert-Graf, J. & Sakhanenko, N. A. 2017. Expansion of the Kullback-Leibler Divergence, and a new class of information metrics. arXiv:1702.00033. Loshchilov, Ilya, Schoenauer, Marc & Sebag, Michele (2013). KL-based Control of the Learning Schedule for Surrogate Black-Box Optimization. arXiv:1308.2655. In order to get well prepared for the second tutorial on probabilistic programming, the second module provides some basics on graphical models and goes towards methods for Monte Carlo sampling from probability distributions based on Markov Chains (MCMC), which is very important and cool, as it is similar as our brain may work and allows for computing hierachical models having a large number of unknown paraemeters and also works well for rare event sampling wich is often the case in the health informatics domain. . and Metropolis Hastings Algorithms The fourth module starts with reasoning under uncertainty, provides some basics on graphical models and goes towards graph model learning. One such MCMC method is the so-called Metropolis-Hastings algorithm which obtains a sequence of random samples from high-dimensional probability distributions -which we are often challenged in the health domain. The algorithm is among the top 10 most important algorithms and is named after Nicholas Metropolis (1915-1999) and Wilfred K. Hastings (1930-2016) – the first found it in 1953 and the latter generalized it in 1970 (remember: Generalization is a grand goal in science). Chenney, S. & Forsyth, D. A. 2000. Sampling plausible solutions to multi-body constraint problems. Proceedings of the 27th annual conference on Computer graphics and interactive techniques. ACM. 219-228, doi:10.1145/344779.344882. KOLLER, Daphne & FRIEDMAN, Nir (2009) Probabilistic graphical models: principles and techniques. Cambridge (MA): MIT press. Wood, F., Van De Meent, J.-W. & Mansinghka, V. A New Approach to Probabilistic Programming Inference. AISTATS, 2014. 1024-1032.